When I stumbled upon Carbo way back in January 2016, I praised it as a utility that improved my note-taking, bringing my handwritten notes into an editable, digital format. Twenty-one months later, Carbo brings its biggest update yet, aimed at making it even easier to import and export your notes through drag and drop in iOS 11. 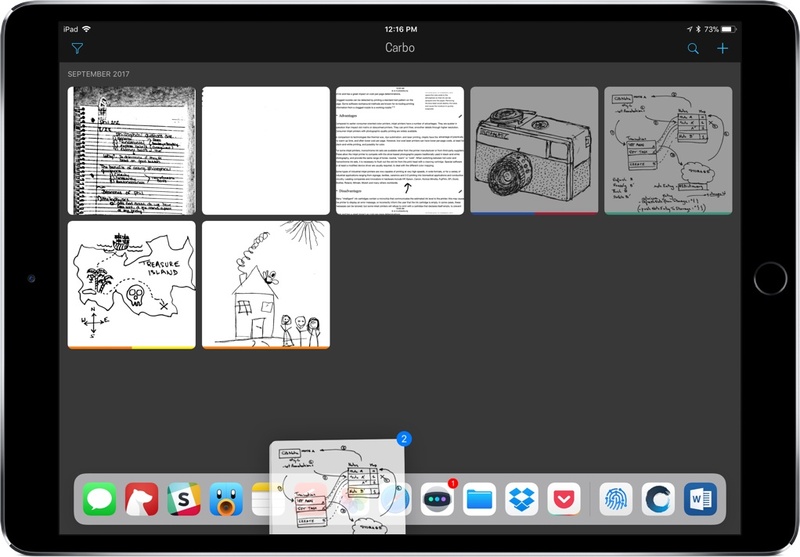 Carbo works with photos of your notes, digitally converting them, and then providing you tools to add, remove, and relocate parts of handwriting. Before its iOS 11 update, getting notes into Carbo required opening the app and snapping a photo with the built-in camera before you could work on the document. In reality though, you may not always have the time to do more than snap a quick picture of your notes from the Lock screen. Now, with Carbo and iOS 11, you can import an image of your notes from Photos by simply dragging it into Carbo for editing. Whether you want to edit your notes immediately or build up a library for later, dragging images from Photos is a much better process than using Carbo’s built-in camera. Carbo also works with Files, so you can directly import from there using drag and drop or by tapping the '+' icon and tapping 'Import File'. If you have had previous scans of your notes or ones that have been sent from a colleague, this integration streamlines that process. If you’re looking to export from Carbo, you can select your files in the app and simply drag them to the new destination. For projects where you have different of media in multiple locations, this is a welcome addition. The latest update to Carbo isn’t flashy or revolutionary. Instead, it simplifies the process of importing, exporting, and using your notes files. Whether you’re a longtime Carbo user or you’re just interested in its new functionality, the update will be appreciated. With its latest version, Carbo streamlines its experience in a way that deserves a second look.